Denise and Grandpa turned to see a refugee from the planet Gorlick behind them. He was green and only about a meter tall. I wrote this for the Rochelle Wisoff-Fields photo prompt writing challenge. The idea is to use the image above as an inspiration for a piece of flash fiction no more than 100 words long. My word count is 97. Thanks. I mentioned they used to be ten cents too, but that put me over my word limit. I think you mentioned once that we are probably of a similar age. 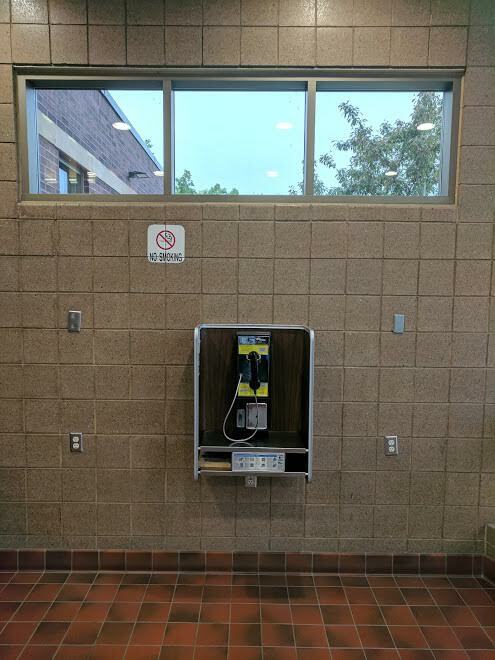 I remember when those pay phones were in booths. Provided Clark Kent a convenient place to change. Yep, I’m sure we’re in the same generational range. What does poor Clark Kent do now. He’ll have to use the co-ed restroom, I suspect. In the 1978 film Superman starting the late Christopher Reeve, Clark was looking for a place to change into Superman so he could save Lois. He looked at a pay phone on a stand. No phone booth. It was a humorous moment. Typo alert! I’m not sure if the name of the refugee center should also have used the full word refugee rather than describing itself as merely a refuge, but certainly the alien from Gorlick was a refugee (with two ‘e’s). Apparently not quite. As of this posting you fixed Refugee Center, but not the “refuge[e] from the planet Gorlick”. Darn. That’s what happens when I try and multitask. Should be all good now. But did you like his story? Well, Dale — I’ve enjoyed James’ writing for a number of years now. However, I find these extremely short word-count-limited pieces of “flash-fiction” extremely frustrating. They can be, occasionally, poignant — but they are far too short to allow any development of character, depth, plot, or other features associated with fine fiction. They are a bit like stand-up comedy — all punch-line and superficial cleverness. They can’t afford thoughtfulness or depth — they haven’t the resources. They offer a writer the challenge of conciseness; and, as such, are good exercise — especially in the sound-bite-addicted media environment in which we too-often find ourselves. But it is, in my opinion, not healthy for readers. And too much of it is stifling to a writer also. Great twist at he end. Sad to think we’ll welcome alien refugees by sticking them in centres too, but I’m sure that’s pretty much what will happen! Actually, our local refugee center isn’t a camp but a resource center. It’s been here for well over twenty years and Idaho continues to welcome refugees from all over the world. I suppose if they start coming from other worlds, we’ll welcome them, too. Thanks, Moon. I needed to create a twist that explained why someone would be using a pay phone so close to the floor. I like the surprise at the end. Hopefully the Gorlick has good contacts. Thanks, Sascha. Obviously the Gorlick has at least one friend to call. Maybe the friend is named Garlic. Great. I wonder how much that call is going to cost him. I was waiting for the twist and lo behold, there it was. A very satisfying end, James. Well done, per usual. Loved your take on the prompt. And enjoyed your follow up comments about Idaho’s resource centre. Very neat twist in the end. Pay phones are so ordinary and I wanted something more dramatic, or at least a little funny. The comparison is a very natural one. I thought it was great how you suddenly moved us, at warp speed, into a different genre! It only seemed like you moved into a different genre. All smoke and mirrors. If they have interstellar spacetravel, I’m sure they can lend us that in exchange for a place to stay. I’d like to think we’ve learned a few things since then. Besides, if we have alien refugees on Earth, what’s it really like out there? Well, there would be the angle of travel for exploration — which we are working on now to the best of our ability. But then some folks say, “Spend the money here on Earth where it will do us some good.” Always half a dozen sides to every story, eh? I can understand your frustration PL with stories that aren’t very developed, and so forth. But I have found that so many works of fiction, the longer kind, don’t involve development or thinking to a significant extent. And then you’ve put more time* into reading such a thing (or wasted large amounts of time in reading many such works), by definition, as each one is longer than some short ones put together. Sometimes it can be worthwhile to read something or see a film, even if it isn’t among the greatest ever (and whether it’s shorter or longer), for the purpose of interacting with others who have encountered the work, to discuss it or what have you. Nonetheless, sadly, even some of the best of this kind of effort is beginning to fail. Too often, young people who are encouraged to read well-regarded pieces aren’t allowed to see what they mean. They are told what to think as to what they mean. The (human) readers themselves aren’t permitted to develop in all reality. As for stand-up comedy, some comics are and clearly always have been better than others. I remember seeing Phyllis Diller (on tv) when I was young, and then imitating her one day. Then I thought to myself the “show” I had done for a friend was stupid. I checked back at the kinds of things the famous comedienne said, and, yep, stupid. How could this person be so successful (with the generation+ before me)? I wondered. + This would be the generation before the baby boomers but then also including the baby boomers (as I am, like someone else [but in regard to another generation] who has posted here at times, right on the cusp where I generally don’t think of myself as a boomer but could be). * There would be an exception to this. If someone flat out had determined to read for (say) an hour per day, fiction, and only for an hour, then it wouldn’t make a difference, time-wise, if the stories were to be long or short, medium, flash, what have you. Meanwhile, I’m also a fan of mainframe computers. There seems to me to be too much of a push for new things these days such that the worth of older technologies isn’t appreciated. Obviously, mainframes wouldn’t need to be as big as they used to be now, but the general concept of mainframes is a solution to some of our security concerns (especially in preference to internet or cloud connections and dependencies). Well, Marleen — These days a smartphone has more computing power than mainframe computer banks had when I was an undergrad in University. Of course, its power is used for applications never yet imagined at that time, rather than for the general-purpose computations then programmed for mainframe processing. For awhile, large computers that were still in a mainframe architecture were used for intensive computations and called “supercomputers”. However, these also were superseded by architectures that used multiple processing units that could share various computational roles. Nowadays, supercomputer processing power can be obtained by networking multiple “ordinary” computers that do not require the expensive and hard-to-maintain hardware of the earlier supercomputer designs. There is no benefit to be obtained by nostalgia for these earlier primitive designs. I don’t know where you observed the distortions of literature that you report. They certainly do *not* represent “conservative” views, nor even a caricature of them. Orwell certainly was demonstrating the logical consequences of socialism, as observed in his own era under communist socialism. But he was demonstrating also the common human foibles that arise under *any* system that abuses power, whereby elite cliques form and usurp power and privilege insofar as they can — until revolutionary forces disrupt their establishment. At present, in the USA, it is the socialists who were recently deposed because of their corruptions; though they continue to fight, tooth and claw, against those who would return the balance toward the fundamental values of the US founders. However, there are still powerful elites of both right and left who are conducting cultural and political warfare; and the individual who was the centerpiece of the constitutional structure, and the rights it sought to guarantee, is frequently lost in the melee. You mentioned the notion of “sharing”. The political arguments about it pivot on the question of whether it is to be motivated by the voluntary choice of educated enlightened individuals, or whether those individuals are to be coerced by governmental force to “share”. The latter is, of course, tantamount to theft; and it reduces individuals to mere ciphers and victims. Only the former can produce ennobled, thinking, active citizens. Such citizens are, of course, viewed by entrenched power centers as dangerous, because it is *they* who are capable of forming coalitions to “throw the bums out”. However, all of this post is quite off-topic from James’ short story above — and because it is so short, it has no capability to offer its readers even the slightest clue whether the alien from Gorlick might be able to offer an objective view of the arguments in which the humans outside the refugee center are engaged, nor to project their consequences. You do present a valid point, though, that increasing the length of a piece of fiction does not guarantee its quality, nor does it guarantee that its readers will bring to it a high quality of analytical skill. The primary advantage of a longer work, from this perspective, is that it tends to limit the readership to those with more stamina, and more diligence, hence possibly to increase the likelihood that they will be likewise better equipped to understand it properly. It’s a clever saying — that about theft — but it isn’t true. Now is it. It has people in its grip. Is it okay to steal some or a little bit, for government to do so? Not one penny can be required. Therefore, in your (current) world view, there can be no taxes and no government. [Further, it isn’t only because of money/taxes. Any government (before Y’shua returns) can be looked at as imposition or a type of stealing of people’s lives. But that’s not practical either.] Except… somehow, it doesn’t matter to many people that it’s inconsistent to say you shouldn’t steal but then go ahead. I know more words can be said. I know the arguments. Each person can pray to our Creator for truth and guidance. And anyone who prays that, I pray for you too. If stand-up comedy is banal, how is a stand-up hate tour the hope of our time? Mindless jabs. Meaningless slogans. This is one of the other ways literature, comedy, musical lyrics can fail when they are meant to be satirical or illustrative of lack. There are those who don’t “get” the irony or criticism, they devolve or conclude that if there are selfish people then I better beat those other guys at it. For years immigration restrictionists have claimed that they love immigrants and merely oppose illegal entry. Apparently that was a bait and switch. President Trump’s first big restrictionist bill proposes to cut legal immigration by as much as half to 500,000 people or so a year. Someone esteemed at this same site (wsj) called it Central Planning (a term recalling big government). It’s a characterization to which the interviewer enthusiastically (already) agreed. Regrettably, Marleen, I cannot read the article at your link, because the WSJ requires a subscription to read any more than the first paragraph. Further, you have exaggerated to the point of absurdity with your all-or-nothing statement about taxes and government. The foundational American view was that taxation and the purposes for which it would be used could only be justified if the people were appropriately represented by elected officials who were responsive to the views of their constituents; and that government itself was to be subservient to the consent of the governed. This was how the philosophical problems of “theft” or “imposition” were resolved — with a sense of balance, as in a system of “checks and balances” whose administrators were required periodically to be dismissed and to reapply or to allow others to be voted into their place. Your WSJ quote about “bait and switch” is also tendentious. Under present conditions where illegal intrusion has overwhelmed any reasonably normal process whereby immigration is legally controlled, a period of readjustment is required. In order to re-assert control over immigration, it is necessary to limit it severely for a temporary period until the current mess is sorted out. At the same time, the machinations of illegal intrusion must be eliminated altogether insofar as possible. Lives depend upon doing so as quickly as possible. When a boat is leaking, one must stop the leaks and also bail out the excessive water that has entered already. But analogies aside, fixing the immigration process requires time and careful consideration to evaluate how best to deal with individual cases of the intruders — whether they merely overstayed an allotted temporary permission, or whether they are actually refugees fleeing persecution, or whether they had nefarious purposes. Compassion for the first two categories does not override the need to deal severely with the third. No one has a right to immigrate to the USA, no matter how great is their desire or need; and no one has a right to flout its immigration laws. Consequently, the USA has no obligation to accept any immigrants whatsoever, and it has every right to make its own decisions about how to exercise compassion toward refugees or about anyone who might possibly make a positive contribution to the nation. As regarding “hate”, neither side of the present kulturkampf has a monopoly on hateful speech. There is also a great deal that may be criticized justly and righteously in civil discourse without the criticizers being deemed “hateful”. At present, the term is used far too freely and unjustifiably merely to delegitimize opponents without truly addressing the merits of their arguments.